Telepath politics. Gunboat diplomacy. Newlywed apartment living. Doesn’t sound like much. SPOILER ALERT: We absofragginlutely loved this episode. 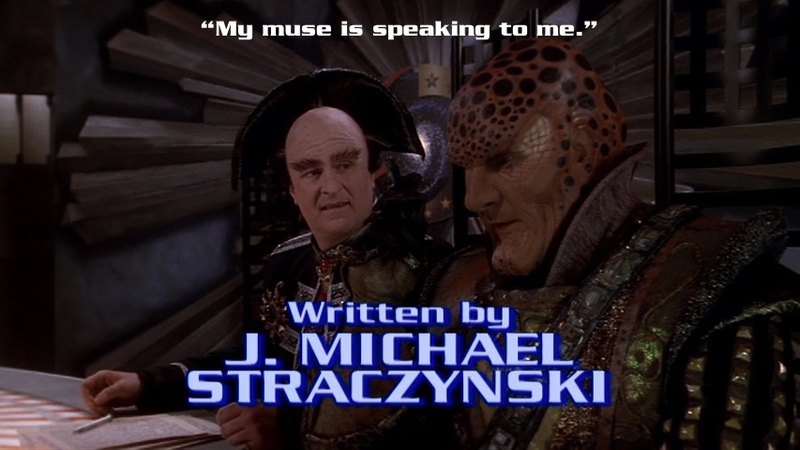 Regarding the fact that humans are the only race in Babylon 5 that has any kind of cultural issue with telepaths, my theory is that since humans are the newest space-faring race, most of the other races would’ve gotten their telepaths in the lead-up to one of the prior Shadow Wars, so they’d have had telepaths for at least a thousand years, compared to Earth’s century. That gives the telepath gene plenty of time to propagate throughout the population, so most Centauri or Minbari “normals” are actually P1s or P2s by the human scale. We’ve seen plenty of non-human, nominally non-telepath characters demonstrate some kind of psychic power in the show; Londo could see the future, and indicated it was common for Centauri, even those who weren’t powerful seers who could tell others’ futures. G’Kar had a powerful reaction to dust, which IIRC required some dormant telepathic ability, and Delenn could sense the Shadows around Morden when she met him. So my guess is that the reasons the other races just let their telepaths do whatever they want without a lot of regulation or social restrictions is that everyone has the minimal psychic potential to tell if they’re being scanned. Once you can feel that a telepath is taking a peak at your thoughts, a lot of the privacy fears are at the very least mitigated. I feel like that makes some sense out of what’s probably just sketchy world-building in an area that wasn’t really relevant to the story. I think that you point to a reasonable explanation even without supposing widespread minimal telepathy: time. If most species have had telepaths for a thousand years, they’ve had time to work out cultural solutions to problems posed by the existence of telepaths. The Minbari actually make a fair amount of sense here in how they’re portrayed. The only one among the major races for whom it might be a serious question if they’re plausible with telepathy are the Centauri, and (as you note) they seem all to have psychic abilities of some sort. I’d suggest that Centauri perhaps routinely have the ability to block casual telepathic scans, and that it takes a lot of effort and time for a telepath to probe most Centauri minds, allowing for a society with as much intrigue as the Centauri are portrayed as having. Overall, I think the existence of telepaths for as long as they’re supposed to have existed among humans would have a much more radical effect on human society and culture than B5 portrays. There would be a case for viewing it as the most radical development in all of human existence since the development of language. But this is entirely defensible on the grounds that we want the story to be able to say things about our current society using an imagined future as a vehicle. B5 was, after all, being made at the end of the 20th century (and primarily for Americans), not for humans in other states in the distant future, and has a specific agenda of *not* portraying its human characters as inhabiting a very different society from late C20th America. It’s asking how recognizably contemporary humans would react to telepaths, not trying to work out thoroughly how the existence of telepaths might change the way in which we think on a basic level, so that we would no longer be recognizable as contemporary humans. One problem I had with the episode, was that nobody seemed to think of using non-human telepaths. The Minbari have telepaths – so why doesn’t the Alliance use those? Whilst I could see Sheridan and Garibaldi being blind to the idea of using other races, Delenn at the very least should have thought of it. For the telepaths themselves, their desire to work in return for somewhere to live, but refusing to make use of the one marketable skill set they actually have seems nonsensical. I understand them refusing to be misused, but choosing “minimum wage” type of work which any mundane could do, over potentially highly paid “specialist” work would seem to lead to them being taken advantage of far more than if they embraced their skills.